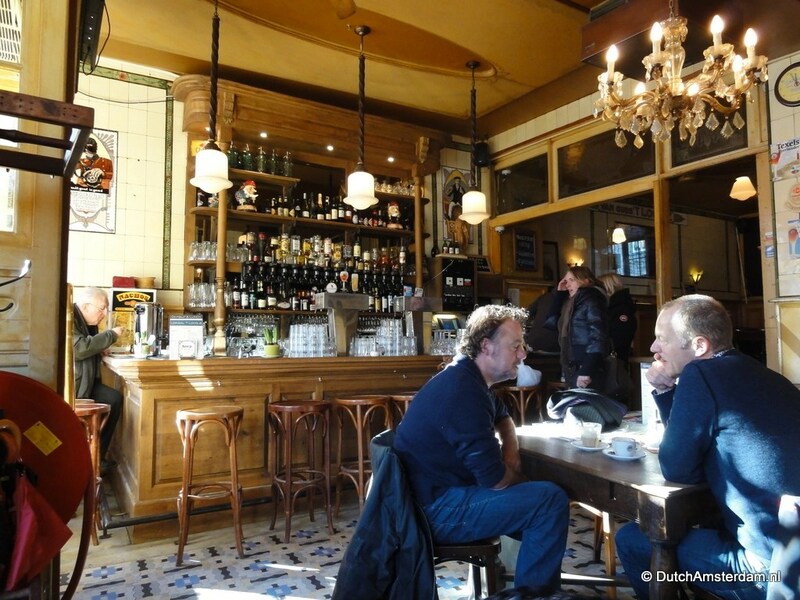 There are over 500 cafes of one sort or another in the centre of Amsterdam alone and among these the bruine kroegen — ‘brown cafes’ — are the friendliest. They are, as the Dutch say, gezellig (yes, that’s a good thing). But it’s clear to see why they were given that name: typically, they’ve got dark wood interiors, low-wattage lights, along with ceilings and walls covered with years’ worth of nicotine stains. In the 1980s and 19090s even some newer pubs were carefully decorated in this – “we’re older than other cafes” – style. Amsterdammers see their local bar (‘kroeg‘ in colloquial Dutch) as an extension – or sometimes even replacement – of their own living room. Whether you read the newspapers over your daily cup of coffee, meet a friend for lunch or a quick bite, or imbibe a few beers after work, for many people their favorite bar inevitably becomes a home away from home. The best way to find a brown café is to simply walk around and pop into the nearest place that looks like it would fit the description. They are social centers for the regulars who use brown cafés as an extension to their living rooms: a place to take breakfast, lunch, dinner and nightcaps, open from early in the morning to around 2 a.m. The atmosphere is generally relaxed, and customers are rarely made to feel rushed. You can linger for hours, if you choose, over a beer or coffee, reading a newspaper or book. Brown cafés are not quaint tourist attractions but rough and ready establishments, truly traditional and thriving. Some are highly successful; the famous Hoppe on Spuistraat, established in 1670, is nowadays renowned for its business-suited clients who spill out on to the pavements in the summer-time. Yet the back bar on the right of the building’s facade retains all of its ancient character and exhibits few panderings to modernity — with the exception, perhaps, of the telephone. Each brown café has its own character and clientele. Ranging from the yuppies of the Hoppe, the jazziness of the tiny Wetering, on Leidsedwarsstraat, or the foreign journalistic babble of Harry’s Bar, on Spuistraat, to the loud card games of the Oosterling, on Utrechtsestraat, or the rugged talk of beery sailers in the Karpershoek on Martelaarsgracht near the Central Station. Behind the bar in a brown café there is often such an extensive range of beverages on offer that knowing where to start can be a baffling business. Three types of beer are normally on tap. The pils, or lager, is usually from the Dutch Amstel or Heineken breweries. The two other most commonly tapped beers are “blond” and “dark” or “brown” beer, both types nearly always imported from Belgium and stronger than normal pils. Once beyond the realms of the beer on tap the choice of bottled beers and stronger liquors becomes a minefield of exotic labels. You can choose according to the strength of the beer, country or even region of origin. The choice is wider still in cafés like In de Wildeman, at Kolksteeg 3, which is a proeflokaal or tasting-place and has 18 different beers on tap alone, or the intimate Gollum, on Raamsteeg 4, which offers a choice of at least five beers from each of the 10 different countries chalked up on the blackboard. It is most common to pay for drinks by running up a bill rather than paying for each individual round. Bar staff juggle rows of small order pads or a large book, in which they keep a record of proceedings. A mime of the act of writing is usually enough to communicate that you will pay at the end of the evening. Once this has been established it is easy enough to lose track of the amount you have consumed, and that is usually the reason for many an over-enthusiastic tasting. A useful word to learn, therefore, is afrekenen, which is the verb for settling-up — and “taxi” is the same word in most languages. In all of Amsterdam there are some 1000+ cafes, bars, or pubs — whichever designation you prefer. At least, there were 1021 pubs in September 2012 — down from 1410 in the year 2000. There are several reasons why traditional cafes are dwindling: gentrification, changing public, rising rents, or whatever. A younger, ‘hipper’ crowd is more interested in coffee or tea salons and trendy delicatessens. In addition, in many neighborhoods the traditional mix of residents has been changing. Due to nuiseance caused by too many tourists — and an ever-growing number of Airbnb rentals — many locals have moved away to suburbs or even other cities. Along with the fact that more and more stores and restaurants cater primarily to tourists, this process has damaged the social fabric of entire neighborhoods.